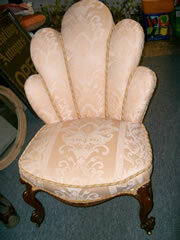 This fabulous chair is of a very high quality. 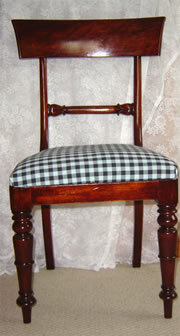 It is made from Rosewood and the patina of the wood is beautiful. 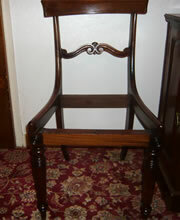 The chair is solid and very heavy indeed .There is some attractive carving and the legs retain their castors. 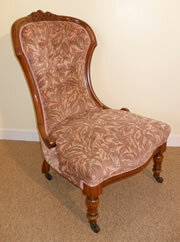 A fantastic quality late Victorian conversation seat with excellent quality carving covered in cream silk type fabric all in first class condition. 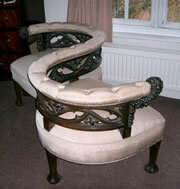 Conversation seats are very rare and do not come along very often. 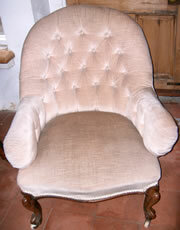 A late Victorian buttoned back tub chair with a pretty shaped back and turned legs, this chair can be recovered without the skirt in customers required fabric. 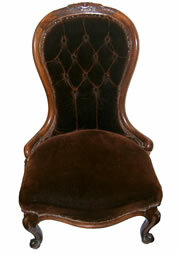 A most elegant 19th century buttoned back library chair with turned mahogany legs to both back and front. 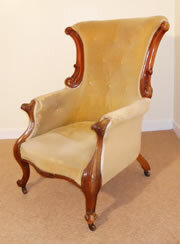 A very near matching pair of Victorian mahogany showood armchairs with cabriole legs covered in cream/coffee velvet these chairs are in very good condition.They can also be sold as single chairs. 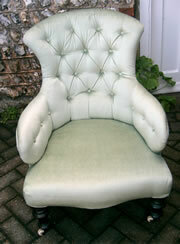 A late Victorian buttoned back chair with turned legs covered in pale green velvet. 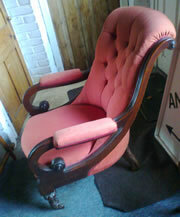 Both wood and upholstery all in excellent condition. 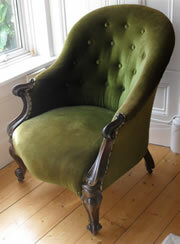 A very nice Victorian mahogany showood armchair with cabriole legs and buttoned back covered in green velvet and in excellent condition 43in high x 27in wide. 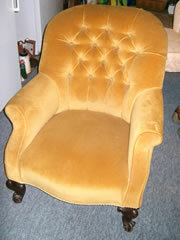 A very nice Victorian wing armchair of good proportions with pretty cabriole legs to the front covered in gold velvet. 30in wide x 40in high at the back x 21in inside seat depth. 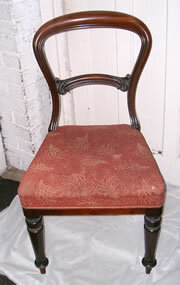 A set of four ROSEWOOD William 1V dining chairs all in excellent condition, one requires the drop in seat cover replacing which was removed for clearing ,or I have made new drop in seat frames for each so you can have them recovered from scratch in what ever material you wish. I will sell individually or as a set.. £50 for one chair or £200 the set complete with the new drop in seat frames plus the original ones. 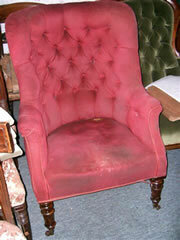 This armchair has a solid frame and dates from the late 1800s and is very comfortable with a high back. 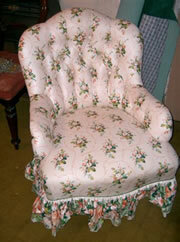 It has been newly reupholstered in a Abraham Mooon fabric from their new Estate Tweeds Collection. 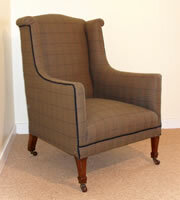 The fabric is 100% wool and it has been piped in a dark navy 100% wool Moons fabric. 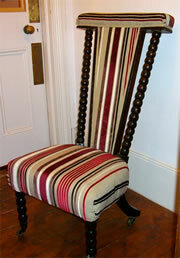 There are square tapered legs to the front and splayed legs to the rear, all retain their original castors. 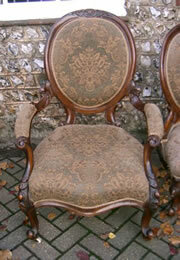 3 William IV dining chairs. 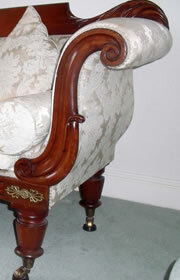 Beautiful, turned legs and classic tulip design on back bar. 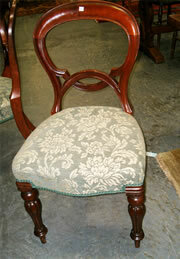 Really good quality mahogany chairs with drop in seats. 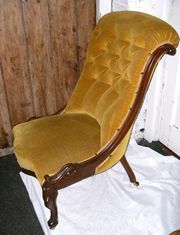 SOLD: A Victorian Mahogany slipper chair, this chair has very good carving and is upholstered in gold velvet. 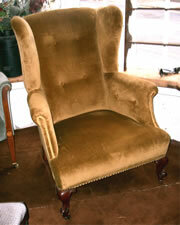 A Victorian Mahogany slipper chair, this chair has very good carving and is upholstered in gold velvet. 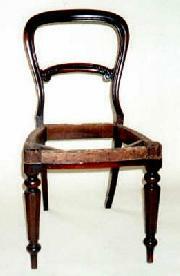 The William IV period is quite a short period between 1830 and 1837. 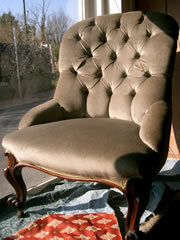 Especially in contrast to the Victorian period of 1837 to 1901. 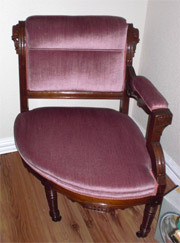 Mahogany remained the principle wood using in the construction of antique chairs, the Victorians polishing the mahogany to the familiar deep red colour easily identified as Victorian. 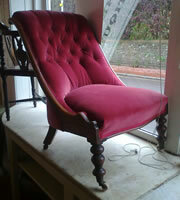 In recent years the deep red is sometimes considered a little too heavy for modern tastes and when Victorian chairs are restored or repolished, it is not uncommon for a request to allow them to lighten a little. 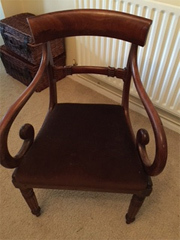 The highly figured grainwork of Walnut also became popular during the Victorian period, almost always on more expensive and refined pieces of furniture, and will almost always be veneer rather than solid Walnut. 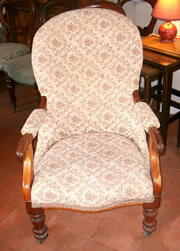 Still today the nutty brown colour and beautiful grain of Walnut remains very popular. 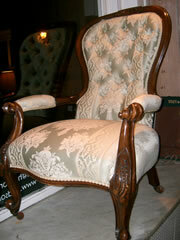 Victorian antique chairs are typically sturdier and more ornate than the earlier Regency designs. 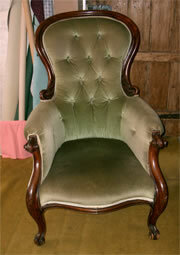 Later the Edwardians would return the more elegant designs, though often narrower or thinner.